Perhaps the most effective tactic adopted by the adversary of man's salvation has been to blind man to the reality of the spiritual warfare being waged for possession of his soul. We have consequently become spiritually flabby and easy prey for the enemy. To escape such a perilous condition we would do well to contemplate more often the examples of the saints who engaged in direct combat with the Evil One, unmasking his deceptions and thereby disarming him. 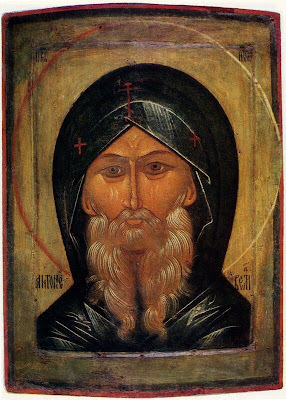 Nowhere is this illustrated more dramatically than in the life of St. Anthony the Great. Written by St. Athanasius who personally knew St. Anthony, this Life is a spiritual classic with which all Christians should be familiar . St. Anthony was an Egyptian, born c. 251 of noble Christian parents who provided well for their son's future by educating him in the fear of God. His parents left this world when Anthony was 18 or 20, and he inherited a substantial fortune in terms of earthly wealth. But although he was at the age most attracted by fortune's delights, he aspired only to amass the riches of virtues. Anthony was reflecting one day upon how the Apostles had forsaken all to follow after Christ. when he heard in church the words of the Gospel: "If thou wishest to be perfect, go and sell everything thou hast...and come and follow Me" (Matt. 19:21). Thus confirmed in his desire to do likewise, Anthony sold his estate and distributed the money to the poor, persuading his younger sister to be likeminded, he gave her into the care of some virgins. The first campaign was waged on the battlefield of the mind. Anthony experienced a barrage of unsettling thoughts--flattery, the allurement of the world and all the pleasures his former wealth could buy, concern for his sister's welfare, the difficulties of the path he had chosen. The vicious net was craftily woven, but the Saint recognized it as the handiwork of his adversary and tore it apart by means of intense prayer and vigilance, deflecting any and all disturbing thoughts before they took hold in his mind. The battle grew more intense when the Enemy', taking advantage of the Saint's youth, assailed him with lustful thoughts, inflaming the natural appetites of the flesh until the Saint was burning with his own lust. He manfully fought back by mortifying his body with increased fasting to quench the passions of the flesh, and by meditating on death and the eternal torments which await those who give themselves over to the spirit of fornication. And so be escaped unharmed, even strengthened by this experience. When the Evil One found himself so disgraced, he took on a human voice and complained bitterly to Anthony: "I have deceived and conquered m a n y in my time; but now in your case, as in that of many others, I am defied by your ascetic labors." Knowing that his antagonist would continue to stalk him as a roaring lion after his prey, Anthony did not allow himself to relax his vigilance on account of his victory. He passed many night s without sleep, en grossed in prayer, and limited his bodily nourishment to bread and water, of which he partook once a day at evening. For, he said, by weakening the pleasures of the body the mind is strengthened. Such disregard did he have for the body as to imitate the nature of the fleshless ones, i.e., the angels. 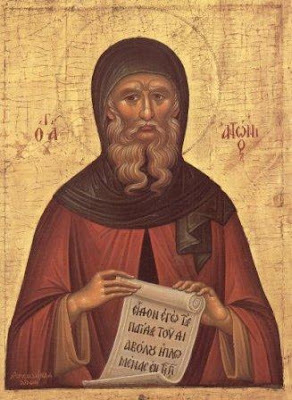 The severity of his labors and his accumulated virtues astonished the older ascetics, but Anthony never thought about his spiritual progress and regarded each day a s the beginning of his spiritual journey, thereby shielding himself from pride and vainglory. "Here, devils, here am I, Anthony, ready for more of your wounds. Try your worst, for you shall never separate me from Christ." He fortified himself by singing the words of the Psalmist: "Though a host should encamp against me, yet my heart shall not fear." Incensed by the audacity of Anthony's challenge, the Devil gathered his minions: "Don't you see now? This fellow could not be restrained either by the spirit of fornication or by bangs and bruises,.. We must assail him by other means." That night, as Anthony was still lying on the ground recovering, a hoard of demons shook the walls of the sepulchre and rushed in to terrorize the Saint. For this purpose they had taken on the forms of hideous wild beasts--hissing snakes, roaring lions, ferocious wolves, a bull which threatened to gore the victim. But Anthony was not frightened by what he perceived to be mere spectral creatures, and he made bold to mock his enemy's impotence: "What is the use of all this vain uproar? If ye have power to hurt, why don't you? But you can't, for the Lord is my shield and my wall of safety." The demons could only gnash their teeth in reply. "I was here, Anthony, but I wanted to witness your combat. Having seen that you withstood your adversary without retreating, I shall from now on be your Helper and shall make your name celebrated far and wide as My faithful servant." Anthony knelt in prayer to give thanks to God for this promise and for the peace and newfound strength which filled his soul, the grace-given rewards of his victory. He was then about 35 years old. 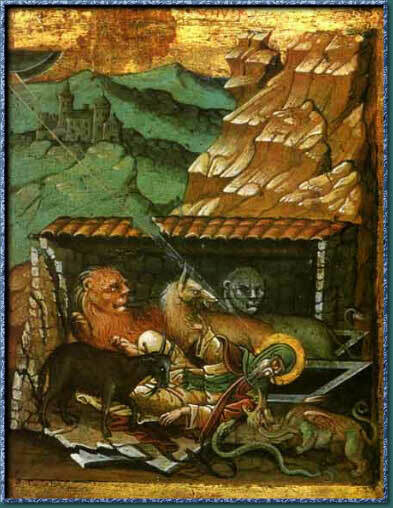 The next day Anthony left the place of the sepulchres to live as a hermit in the desert. Even as he journeyed, the enemy continued to lay all kinds of traps for him, but the Saint was not to be outsmarted. Seeing a large silver disk in his path, he immediately surmised that it was a ruse of the devil, for had some traveler passed that way and lost it, surely he would have retraced his steps to recover such a valuable object. "O Devil," he cried out, "you will not so easily draw me away from my purpose. May you take your silver and go down to perdition together." No sooner had he said this than the silver disk disappeared in a cloud of smoke, proof that it was indeed the devil's creation. At length Anthony settled in a cleft of some rocks beside a river, blocking the entrance so as not to be disturbed. For twenty years he remained there in solitude, admitting no visitors but only a supply of bread three times a year. It must not be imagined, however, that he enjoyed a blissful life of uninterrupted peace. Those who came in hopes of seeing or hearing a word from the far famed ascetic were often perplexed by the raucous din coming from the cleft. They sup-posed a band of angry men had somehow gained entrance, for they could make out shouts of: "Depart from us! Why have you come to our country to cause our death?!" Through a fissure, however, they saw that the Saint was quite alone, and they understood that the tumult was made by demons. Indeed, the demons quite exhausted their bag of tricks in their frantic efforts to deter the Saint from his course, for fear that his example would inspire others to invade their desert domain with fasting and psalm-singing which they found intolerable. And this is just what happened. Whole multitudes began coming to the desert to lose their lives, like Anthony, for the sake of the Kingdom. Persuaded by their entreaties, the Saint relinquished his solitude to share the light of his accumulated experience with these eager new recruits in Christ's army. By word and example he fanned such zeal for the ascetic life that many monasteries--the first in the history of Christianity--were founded under his influence, for which reason he is known as the Father of Monasticism. In guiding these warriors of Christ, St. Anthony exhorted them to pursue their aim with diligence, for "the promise of eternal life is bought with a small price.., and the work is easy, if we be only willing." He warned them of the subtle craftiness of the demonic powers, exposing their numerous tricks and guises whereby they seek to trip and destroy the Christian whom they find laboring on the path of salvation. He spoke of the evil and impure thoughts they try to instigate and of the fearful appearances they assume, of their pretention in foretelling future events. "Sometimes, too, they appear in the habit of monks, and talk very religiously in order to gain our confidence and then to seduce us." At the same time, he encouraged the brethren not to fear when they came under attack, but to fortify themselves by faith and the sign of the Cross: "If they find us rejoicing in the Lord, and meditating or conversing on divine things, then demons have no power over the Christian...for when they see the soul secured by such thoughts, they turn away deeply ashamed of themselves." Besides his extraordinary skill in discerning spirits, St. Anthony had other gifts --of healing, of casting out demons, of foretelling future events. And although he was illiterate he readily outwitted many philosophers. Once, when some 'wise' men came thinking to mock his Christian faith, St. Anthony brought forward several people who were troubled with demons, and said, "Can you heal these men by your reasoning? or by any art or magic, calling upon your idols?" The Saint then called upon the name of Christ and marked the demoniacs with the sign of the Cross, a first, second and third time. Immediately the men were healed of their insanity, and the philosophers departed amazed by the miracle and by Anthony's wisdom. Crowds flocked to this heavenly-born physician of the Egyptian desert, and no one left without being enriched from St. Anthony's store of gifts. "For who," writes St. Athanasius, "went to him in sorrow, and did not come back rejoicing? Who went to him in anger, and was not converted into a friend? What poor man met him, with a dejected heart, who, after he saw and heard him, did not go away despising riches and content with poverty? If a monk was remiss, he excited him to diligence. If a young man went to the mountain and beheld Anthony, he straightway renounced pleasure and embraced a life of temperance. Whosoever came to him, tempted by a demo n, was relieved; or if troubled with evil thoughts was tranquilized." Even when St. Anthony had attained the heights of perfection, he never hesitated to learn from someone else. Nor did he, in his humility, ascribe his spiritual gifts to his own achievements, but exhorted those who benefited by his prayers to thank God Who is the source and cause of all that is good. 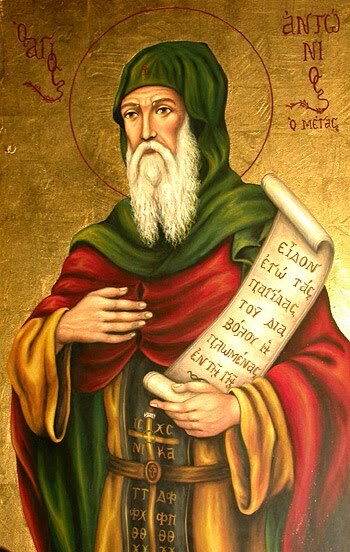 St. Anthony reached the venerable age of 104, still sound in mind and body notwithstanding his severe mode of life, Foreseeing the approach of death, he gave a final word of instruction to the brethren, warning them to beware of schismatics and the Arian heretics, and urging them to diligently guard their hearts and not to fear the demons. He died in peace after a short illness, welcoming his journey into eternity as et foreigner returning to his homeland. His life, once hidden in the desert, became famed throughout the Roman Empire, not on account of worldly wisdom or riches or political power, but because of his profound piety, towards God, to Whom he brought glory and honor.. Amen.